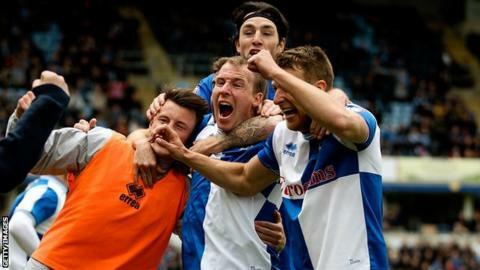 Bristol Rovers manager Darrell Clarke has urged his side not get carried away after their 2-1 win over relegation rivals Wycombe. Saturday's result lifted the Pirates three points above the drop zone and a draw in their final game against Mansfield would be enough to secure their League Two status. But Clarke told BBC Radio Bristol: "We've still lots of hard work to do. "I won't let the players, or anybody, get carried away." Rovers were 14th in the table at the beginning of March, but they were pulled back into a relegation battle after winning only once in 10 games. However, goals from Lee Brown and David Clarkson gave them all three points against the Chairboys, who now occupy 23rd place above already-relegated Torquay. "Everyone was delighted and enjoying the moment on Saturday," said 36-year-old Clarke, who took over as manager from John Ward a month ago. "But it's now about the preparation for the next game, making sure the players look after themselves. "In the build up to games, you can waste a lot of energy on worrying about the game coming up. "There will be a calm approach this week, to build up to the match preparation."